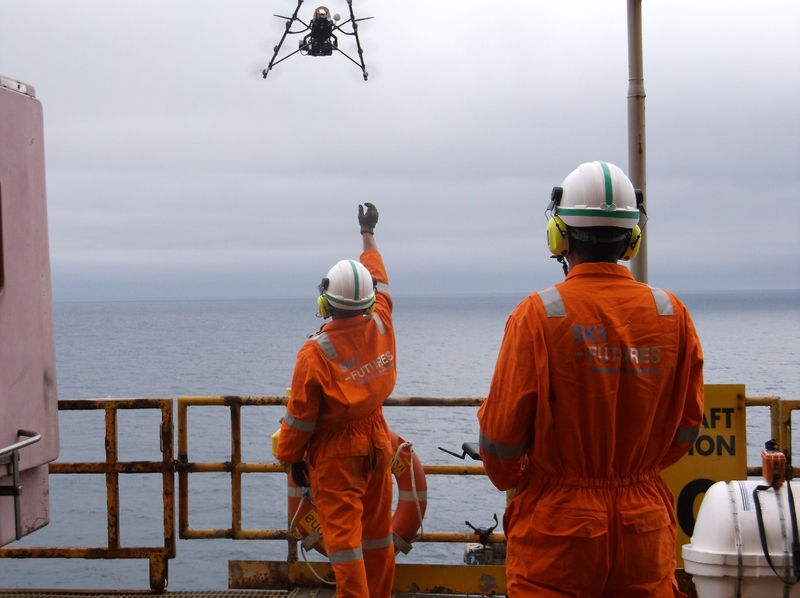 According to the website, Sky-Futures provides Unmanned Aerial Vehicle (UAV) inspection services to both onshore and offshore oil rigs and refineries using drone technology. But there’s a lot more happening behind the scenes and if you lift the bonnet of the company, you will see how they are systematically building technology to automate the entire process. ‘’We have a vision that, one day UAVs (or drones) will be fully autonomous on every platform and every refinery across the world; flying around collecting the data, automatically sifting through it, analysing it and producing insights for the client.’’ says co-founder James Harrison. What inspired the creation of Sky-Futures? One of my co-founders, Chris Blackford and I were working in the military in 2006-07 and it was in Iraq and Afghanistan that we used drones on the frontline. The technology was very good in the military and it was evolving very quickly. Before we went into a new hostile area we would get the drone to continuously fly around that area. We used very basic algorithms to pattern match, to see what was happening on the ground. We were actually looking for the absence of the normal – an anomaly, which helped. And it was the understanding of the power of this technology, especially in the context of the military, that led us to think what else we could do with this. Alongside Nick Rogers, a commercial airline pilot, we set up the business in 2009. We took a fair amount of time to think about where commercially the best fit was. After looking at all sectors, we concluded that the oil and gas territory was the hardest to penetrate and had the most barriers to entry. As a first mover, we thought that to focus specifically on one sector and become a niche within that sector would prove our ability to operate commercially, safely and effectively and also enable us to create market-specific solutions to stay ahead. When you started, were there other players in the market? There was one another company that was delivering similar work in the oil and gas sector but very early on we took the view that providing just a service using drones would quickly be out of date. We are a drone enabled data company. That’s actually how we see ourselves. So the drone helps us get the data, but the data is what we really care about. Furthermore, in Q1 2016 we are bringing out a range of new products which will really differentiate us from the market. How has the commercial drone industry developed over the years? As far as the drone market goes, you can look at the amount of people that now have a license to operate drones in the UK, it used to be only a handful when we started out back in 2009. We had one of the very first licenses to operate drones commercially and now there are hundreds of businesses and individuals using them for a variety of purposes- from BBC documentaries to estate agents taking pictures of houses. A lot of people are building drones, but I think the number of hardware companies will reduce in 2016, bringing the main players to the fore as they make more sophisticated and capable drones. We actually have our own UAV training academy and we are the 3rd qualified entity to do this. We are certified by the Civil Aviation Authority and we can train outside individuals as well as our own staff to become pilots. Our own remote pilots go through a month long course, which is specific for oil and gas centred on a ground school and safe operating procedures. We realised that we could use our experience and high-quality CAA approved training to deliver high-value operational training to companies, specifically within the emergency response sector. It’s not an area where we would ever provide our own service, but what we can do is train other services where there is a high level of scrutiny on safety and operational procedures, which is similar to oil and gas. What are the barriers to entry in the commercial drones industry? The regulatory environment is not only difficult in the UK but also in the US. No one was allowed to operate commercially really until the beginning of 2015. We managed to get the 42nd exemption to operate in the US, which is super early and the only reason we were able to do that was because we had been really working hard for the previous 18 months to press the cause and let them know how we operated elsewhere. We have actually advised, helped & shared a lot of our documentation and a lot of our processes with different aviation industries around the world. We have worked in 16 different countries, a lot of those countries don’t even necessarily have the legislation in place. We try to work closely with different authorities and regulators so they can understand what safe and excellent operations look like, and this enables us to deliver work commercially. Other barriers include educating the clients as to what a good service looks like. This is something we overcome by understanding their needs, having safety centered operational procedures and delivering safe and efficient services. What are the challenges of working in a global market? There are of course physical challenges of working on a global scale. When you are running a new business sometimes you need to be there to oversee things, which can be difficult at times. Another aspect is understanding the culture, which varies widely from one country to another. For us, the key to this was building long-term local partnerships rather than hiring project specific agents. This helps in a lot of ways; working within the regulations, hiring and moreover adapting the firm to the local culture. We work very closely with these partners as we understand we cannot be entirely based in London and run a successful global company. For us global expansion panned out a bit differently. We were aware of the global potential of our business and we had a strategy in mind. We decided to have an ‘’anchor client’’ who can then help us expand in other countries. For example, once we worked for Shell in the UK and once they were convinced by our product, we had a stronger case to pitch to Shell Malaysia or Shell US, as they are aware of their global processes and practices. At seed level, it’s really positive. If you are going to raise seed capital, the UK is particularly good, because you’ve got EIS and SEIS where people can invest and reduce their tax liability and risk in the company. Series A is very good in Europe and there are many investors to support you. We were backed by MMC Ventures, both from the MMC London Fund and their EIS Fund. What are the three factors that have influenced investment decisions in your favour? We have taken a long time to build-up our focus on a core product and as much as that was painful, because all you want to do is expand very rapidly and grow the business, it enabled us to get a solid foundation. As a result, we gradually started showing large growth in revenues and customer acquisition across a wide geographical scale. We focused on one problem in one industry and I think that was really the key for us. If we were to try and serve multiple markets, the team would need to be duplicated for every new market, as there are new problems to solve, eventually losing focus. Even now we are always trying to refine it, carve a niche and we are working hard to maintain that focus. Sky-Futures is an early leader in what we believe could be a massive market for drones and data analytics in oil and gas. MMC led their Series A based on the team, the technology and our conviction that there’s a huge opportunity to go after. It’s early days, but we are being proven right by the impressive client list that they’ve built over the past year. We’re excited to be working with them and pleased to see them being recognised as part of the Scale-Up Club. Sky-Futures recently joined the SVC2UK Scale-Up Club, what’s next? The journey to get there was difficult, but we took a view very early on to grow aggressively and we used different growth and development strategies for it. We are more American in our view, we want to be number one globally and we absolutely understand where this technology can go and if we don’t give it our all and go for it, we’d feel like failures. We are not interested in growing a small business. We want to be the number 1 dominant business in our sector. Getting into the Scale-Up Club is a very good indicator of the approach we are taking. It’s certainly not the route for everyone. It’s very stressful. If you don’t want to work with high-level risk, I would probably not recommend it. Our vision is very ambitious and there’s absolutely no reason why we can’t see it becoming true. We just need to keep delivering and keep the business growing and we’ll get there. What would you tell the budding entrepreneurs who are looking forward to scale-up their businesses? Stick to your focus, don’t be lured by short-term revenues which can distract your focus from the core business. We turned down a single large contract which was bigger than our annual revenue at the time because it was in a different industry. That led to quite a few sleepless nights, it felt like a horrible decision at that time. But had we taken that contract we would have lost our focus and we would be nowhere near where we are today. It’s a very challenging decision to make as you are weigh everything- Can I do this one job and go back to my core product? Or what happens if I don’t do it? It’s also important that once you’ve made a decision, you evaluate it in time and are flexible. If you do make the wrong decision, don’t keep investing into it, don’t be afraid to pull out of it.